If you cat just loves spying on the neighbors (don’t you wish you could spy on them too?) or staring at the dog next door with her “I-don’t-care-who-you-are” glares? Then why not make your cat’s window time a little bit more comfortable? 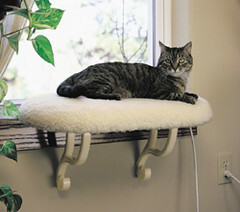 The Orthopedic Window Perch attaches to window sills, so your cat can stare outside the window all day long in comfort and luxury. There is also a heated version for those chilly days. This entry was posted on Tuesday, May 29th, 2007 at 11:00 am	and is filed under Cats, National Dog, Cat & Pet Info, Products & Services for Cats & Dogs. You can follow any responses to this entry through the RSS 2.0 feed. Both comments and pings are currently closed.